Buddhism is starting to take root in areas of the world that would have been impossible even a few years ago. This is one of the advantages of Kadampa Buddhism. Because it is not tied to Tibetan culture and politics, it is able to adapt flexibly to different customs and lifestyles whilst providing the pure Dharma teachings of Buddha and Je Tsongkhapa. And check out a photo story detailing an earlier trip. There are a growing number of personal blogs by Kadampa Buddhist practitioners talking about how they integrate Kadampa Buddhism into their daily lives and use it to solve their own and others’ problems. 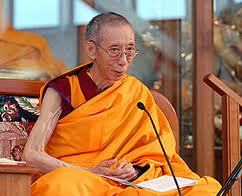 For example: This Mountain, That Mountain and I Love Kadampa Buddhism. These blogs and so on* offer a small taste of a large variety of NKT students from all different walks of life. Tens of thousands of Kadampa Buddhists are scattered all around the world, East and West – some living in Centers, most living outside and working regular jobs – and all trying their best to integrate Buddha’s teachings into daily life to find inner peace, control their minds, and help others. If you have any helpful experiences you’d like to share, please feel free to post them to the comments section of this article. You are currently browsing the archives for the Kadampas’ blogs category.